In my effort to cover all things transformers this summer, I stumbled upon M&M’s. Ok, I would be lying if I said I do not eat M&M’s on the regular but not as often as I did for this series of blogs. I added at least a pound eating these dang things and burned up some gas finding all the packages. 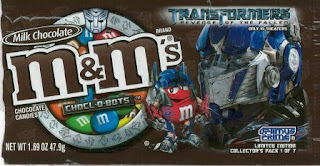 M&M’s stepped up the Transformers 2 promotion with seven new packages and one new flavor. The first cover shows Red in his transformer attire with Optimus Prime and the official logos from the latest movie, including the weird symbols that I have yet to understand, probably because I have not seen the movie. Optimus Prime, being the leader of the heroic autobots gets top billing in this series as made official by placing him on package number one. I am partial to this one of all the package mostly because I am a prime fan and love the big red semi, have since a kid. I actually own several versions of the big guy and cannot wait to see him in the next movie and the cooresponding toys. While the package is cool and definitely increased my M&M’s intake, it really does nothing for the overall flavor. They are still the same chocolate candies and still melt in your mouth as well as your hand in this heat.